It's one of the most historical cemeteries in Bay City, but it's also something of an orphan. For a number of years Bay City's Pine Ridge Cemetery, which includes Soldier's Rest, has had no owner. Once overgrown and forgotten, the burial grounds were rediscovered some 16 years ago and volunteers have undertaken the job of maintaining the grounds and documenting the graves. The grounds are the final resting place of some of the most famous founding fathers and other leaders of Bay City. Within the grounds a special ring of graves and markers commemorate the area's civil war soldiers. Known as Soldiers Rest, these graves are acknowledged by the government and designated as an official military cemetery. Since its rediscovery, the group of interested individuals formed a loose network and began work on the grounds. Civic groups and businesses have joined these friends to help with clean up days. The City has assisted where it can, even though it doesn't own the property. In fact, nobody owns the grounds. Over the last couple of years a formal group has been organized into The Friends of Pine Ridge Cemetery. They have registered as a 501(C)3 non-profit, elected officers, established a bank account, and hold monthly meetings. Besides those efforts, they also WORK. They mow, rake, probe the grounds, repair markers and improve the grounds. Each year the group holds Memorial Day ceremonies. As new burials are discovered they either find and repair the headstones or, in the case of civil war soldiers, petition the government for official markers. There have been several isolated incidents in which stones were violated. 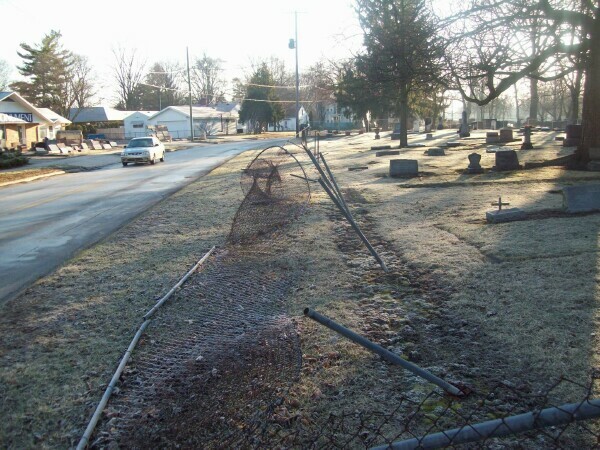 This past winter there were two cases where hit-and-run drivers on Ridge Road completely destroyed the fencing that ran along the road. The "Friends" group has worked diligently over the past couple of months to come up with a plan to replace the fence. Bay Farm Services has volunteered the labor to install the new fencing provided the Friends can raise the estimated $3,875 to cover the cost of materials. As of now the group is about a third of the way to that goal. A fund raising effort is now underway. Interested contributors can visit the friend's "Go Fund Me" web site at www.gofundme.com/pine-ridge-cemetery-fence-project/donate. They can also visit the Friends web site at www.friendsofpineridge.com. As spring arrives, a new season of work begins at the cemetery. A work day is being planned, and mowing schedules are being assigned. An Eagle Scout candidate will be doing his service project on the grounds soon. Anyone interested in joining the team is encouraged to visit the web site for more information. Pine Ridge Cemetery is located on Tuscola Road (M-15) at Ridge Road, just East of McLaren Bay Regional Medical Center. The grounds are open to the public. Signs on the grounds help interpret the grounds.